At summer’s end, the last of the heirloom tomatoes that come from our garden are usually in less than pristine condition—the cooler nighttime temperatures, plus the shock of excess water intake from an occasional early autumn rain after months of hot, dry conditions tend to make most of our late tomatoes, but especially the thinner-skinned heirloom varieties, split. 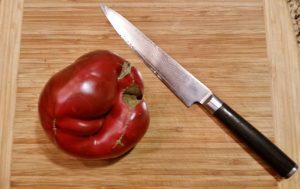 Although they look ugly, with a little judicious surgery they can still be used, and that special, rich flavor of heirlooms enjoyed. First, make the tomato sauce so its flavors can be melding. Over a bowl so that you catch all of the juice, cut out any splits or other bad parts of the tomato and discard them (we feed them to our chickens), then, while holding it by the stem, with a sharp knife slice a cross-hatch pattern into its surface, then slice under the cuts about a half inch down to separate the pieces, and repeat until the entire tomato has been diced. Be careful not to cut yourself! 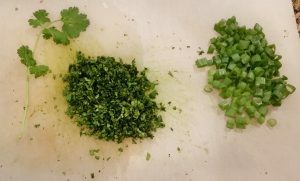 Finely mince enough cilantro to make two to three tablespoons, and chop a similar amount of green onion tops. Coarsely chop the garlic and jalapeno (we ended up using two instead of one, because the red one had no heat). Add all to the diced tomato. Juice the lime, add the juice (if the lime is juicy, one will be enough, but use two if it’s dry), and stir to mix the ingredients. Add salt to taste, and set the tomato mixture aside. Begin heating the water for the pasta, then prepare the mushroom topping. 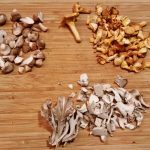 Using whatever mushrooms you have available or prefer—we happened to have some chanterelles, maitakes, and shitakes on hand, so used a mix of all three—chop the mushrooms, then sauté them in butter until they are just beginning to get crispy. Remove from heat and set aside. Cook the pasta according to directions. We used bucatini, which looks like thick spaghetti but the noodles are hollow inside, because its chewy texture made a nice contrast to the delicacy of the topping. 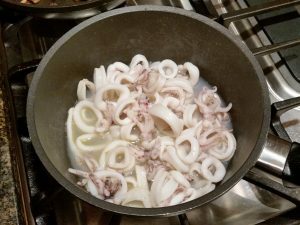 While the pasta is cooking, cook the calamari by adding a small amount of olive oil to a saucepan, adding the calamari, and simmering on low while stirring. The calamari will give off liquid as it cooks. Be careful not to cook it too long, or it will get tough. Once the edges of the rings begin to curl, it’s tender and done. Drain the pasta and return it to the pot. Pour some of the liquid from the calamari over it and toss to coat. 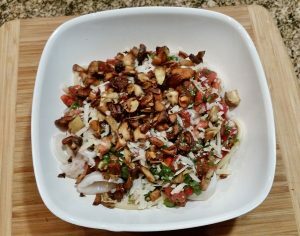 Serve in bowls as follows: add desired amount of pasta, top with calamari (use a slotted spoon to serve it, to avoid adding too much liquid), top with the tomato sauce, then sprinkle crispy mushrooms and a little grated Parmesan cheese on top to finish. I regularly receive inquiries asking when the next–and final–installment of The Strongbow Saga will be coming out. It has been a while since I’ve given a detailed status update, so here it is. My goal and plan has been to complete and publish the fifth and final book during 2016. That is still my hope and goal, but my progress is admittedly far behind where I’d thought to be at this point in time. I suspect many readers wonder, “How can he take so damn long to write a book?” It’s a fair question, and one that deserves an answer. After all, many authors turn out, on average, a book per year, and some more than that. I have one author acquaintance who cranks out two or three books every year. They’re considerably shorter than my books, and they’re urban fantasy, written straight from her imagination, but she’s a talented author and they’re good books. Why can’t I do that? There are several reasons. First of all, I live on a small farm. My wife, Jeanette, and I produce a large percentage of the food we consume each year. We have animals: a flock of chickens and a herd of sheep. All of that takes time–a lot of time–to tend to. Many times it’s not just time; we do quite hard physical labor. I’m not complaining–I love this life–but I’ll be 65 this year, plus I have Multiple Sclerosis, so often I simply don’t have the energy, after a long day’s labor, to write. The author I mentioned above just walks to her in-home office, sits down, and writes every day. She doesn’t have a farm to run. Second, in addition to our farm, my wife and I run a small business–our publishing company that publishes my books–on the side. Every month I have to process our company’s royalty earnings, pay the company payroll, pay the state and federal taxes and prepare and submit the various reports required of a small business by the state and federal governments. All of that requires a considerable amount of time each and every month. And periodically there are other time consuming aspects of the business. In recent weeks, for example, a lot of my “writing” time has been taken up with preparing the German language edition of Dragons from the Sea for publication, in the various e-book and print formats it will be released in. Last, book 5 is proving to be a hard one for me to write.There is a lot of research to do. Book 5 has two main locations: Russia and Ireland, and digging into what was happening in both of those, during the mid 9th century, takes a lot of work and time. Also, this book is the culmination of a long, continuing story that I have been working on for at least fifteen years. I want to get it right. I want the conclusion of Halfdan’s story to be a satisfying, moving finale to what has come before. I cannot rush it just to get something out there. To do so would dishonor myself, not respect Halfdan and his story, and be unfair to all who have been loyal fans of the Saga. Here’s a recipe for a classic Irish dish, Corned Beef with Vegetables, just in time for St. Patrick’s Day. And this is a dish you should make a large quantity of, because there are three bonus meals you can make from the leftovers. 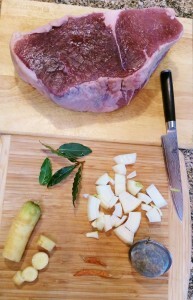 Beef is corned by soaking it for days in a spiced brine mixture. While it’s certainly possible to do yourself, it takes time—most recipes recommend brining the meat for at least eight days. If your grocer can get good quality uncooked corned beef, or better yet, if there’s a local butcher shop that makes its own in-house corned beef, that’s a much easier route. As I mentioned, you should buy extra—as an example, just for the two of us, each year Jeanette and I buy a three pound corned beef roast from Long’s Meat Market in Eugene, Oregon. You’ll want to start this dish fairly early in the day. Coarsely chop one thick slice of onion and one carrot, and arrange them in the bottom of a slow cooker, aka crock pot. Place the corned beef on top. Add about four bay leaves, plus the following spices: 1 tablespoon of coriander seeds, 1 dried chili de arbol pepper, and 2 whole allspice cloves. To keep them together, tie the spices up in a piece of cheesecloth, or—as I do—put them in a large stainless steel mesh tea ball. 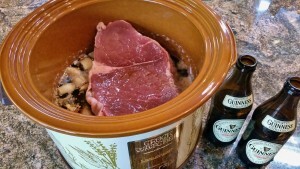 Add one to two bottles of Guinness Stout to the pot, until the meat is at least half submerged, and cook. How long and what setting you’ll use depends on your crock pot—we use the high setting on ours, and it still takes close to five hours. Periodically turn the beef so all sides cook submerged for some time. During the time while you’re waiting for the meat to cook, you’ll need to make two sauces and prepare the vegetables. For the Horseradish Cream Sauce, mix together 1 cup of thick plain Greek yogurt, horseradish to taste (we use about a half of a cup), one-fourth cup chopped green onion, 1 tablespoon of chopped parsley, 1 teaspoon of freshly squeezed lemon juice, and sea salt to taste. A word about the horseradish: try to get pure grated radish. Most of what’s sold is actually a horseradish cream sauce, with much less flavor (we use Tulelake brand Old Fashioned Horseradish, made in Hillsboro, Oregon). After mixing all ingredients together, chill for at least one to two hours before serving. The sauce will keep for several days in the refrigerator. The second sauce is a Guinness Mustard Sauce, for which you’ll need one-half cup of a good, tangy Dijon Mustard (we use Old World Gourmet brand), 2 tablespoons of a coarse-grained mustard, 2 tablespoons of Guinness, 1 tablespoon of finely minced shallot, and 1 teaspoon of golden brown sugar. After mixing all ingredients together, chill for at least one to two hours before serving. The basic vegetables for this dish are potatoes, onions, carrots, and cabbage, but we like to also add parsnips, turnips, and rutabaga. You’ll need a large onion, 4 to 5 carrots, one head of savoy cabbage, and if you add them, about 2 parsnips and one each medium turnip and rutabaga. 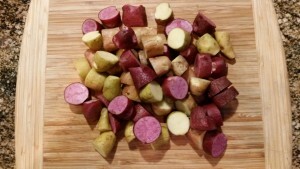 You’ll also need enough potatoes to make about three cups coarsely diced. When we cooked this dish a few days ago, we were able to harvest the parsnips from our garden, and pulled the turnips and rutabaga, which we’d harvested from our 2015 garden and frozen, from the freezer. Cut all vegetables except the cabbage into roughly three-quarter to one inch pieces and place into a Dutch oven or similar large pot. Cut the cabbage into wedges and arrange on top. By now, hopefully the corned beef is beginning to show signs of getting tender, but is still a ways from being fork tender. Ladle most of the Guinness broth from the crock pot into the Dutch oven, until the vegetables are almost covered, and add more Guinness to the crock pot to replace the removed liquid. Bring the liquid in the Dutch oven to a simmer and cook until all vegetables are tender, which will probably take 45 minutes to an hour. 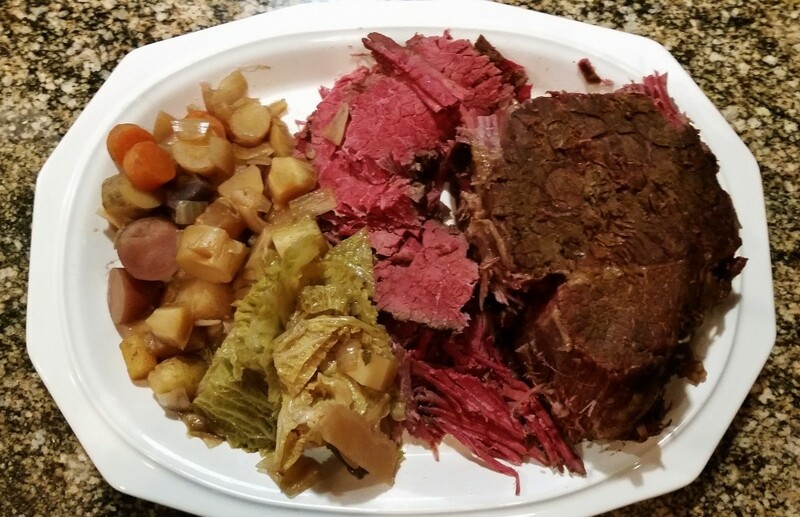 If Irish eyes are smiling on you, by the time the vegetables are done, the corned beef will be, also–it should so tender you can shred it with a fork. Remove the beef from the crock pot and cut one to two slices per serving. Add vegetables, and serve with the two sauces. The leftovers are a wonderful part of this dish, And be sure to save all of the Guinness broth from both pots–you’ll need it for bonus meal number three. This can be eaten either as a breakfast or dinner. 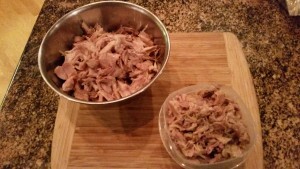 Cut several slices of the leftover corned beef, shred, and put them in a large mixing bowl. Dice or coarsely chop some of each of the leftover vegetables, add to the mixing bowl, and stir together with the meat. Beat one egg and stir thoroughly into the hash mixture. In a large nonstick skillet, add some good quality, flavorful olive oil to cover the bottom plus about a tablespoon of butter. 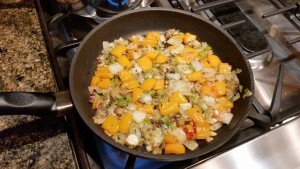 Add the hash mixture, flatten it to a uniform thickness with a spatula, and cook over medium heat, adding oil if necessary, until the bottom browns. Using a large spatula, turn the hash in sections and brown the other side. Serve topped with a fried or poached egg, with the two sauces. Spread slices of a good quality, firm rye bread with your preference of either Guinness Mustard or a Thousand Island Dressing (or both). Top one-half of the slices with sliced corned beef, some good quality sauerkraut (this year, for the first time, we made our own), and sliced Swiss cheese, preferably Jarlsberg. Warm in a 300 degree oven until cheese begins to melt, top with remaining slices of rye bread, and serve. Coarsely chop any remaining corned beef, combine with remaining vegetables and the Guinness broth, and freeze for a future meal. I’ve written before on my author page on Facebook about the flock of crows Jeanette and I have formed a relationship with here on our farm. They are astonishing creatures: very communal and social, and extremely intelligent–according to some sources, the most intelligent of all birds. From some of the things we’ve seen, I can well believe it. It is well documented that crows will sometimes form relationships with humans, particularly if the humans feed them regularly, and on occasion they will even even give gifts, such as some sort of shiny object, in return. Our own relationship with our local flock of crows involves a mutual exchange, but of a different sort: we feed them twice a day, and in return they provide us a valuable service. It all started one summer about two years ago, when a pair of red-tail hawks set up housekeeping on the forested mountainside just across the river from our farm. We keep a small flock of chickens, and during the day they free range in two small fenced pastures just off the barn, where their coop is located. In the past we had occasionally lost a hen to hawks, but that summer the red-tails caught and killed three of our birds, a rate of loss our small flock could not for long sustain. Around the end of that summer our Border Collie, Sigrid, had an unfortunate encounter with a nest of yellowjackets, which led to her developing some skin allergies. As part of our efforts to keep those under control, we switched her to a new dry dog food. We had over half of a bag of the old feed left, so we tried putting it out for our chickens. They didn’t particularly care for it, but the large flock of crows that live near our farm loved it–we noticed that whenever we put some of the dog food out, they would fly in and eat it as soon as we left the area. Hawks and crows are natural enemies, and we had, on occasion, seen crows attack a hawk and drive it away. Crows are incredibly agile, acrobatic flyers, and they fight a hawk by climbing up above it then diving down and swooping past the trailing edges of its wings. Although I’ve never seen a hawk actually get injured by this kind of attack, after it happens repeatedly it unnerves them, and they fly away to escape the harassment. So we decided to start feeding the crows regularly, to see if maybe they’d hang around more frequently. 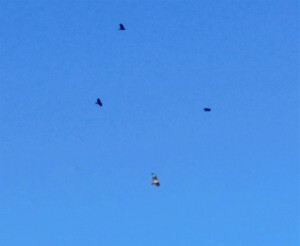 Crows attacking a hawk over our farm. The arrangement has proved more successful than we could have dreamed. We now put food–a small scoop of five grain chicken scratch, and a large one of dog food (Safeway brand small bites formula is their favorite) out for the crows on the driveway in front of our barn twice per day–once in the morning, when we first go up to open the barn and let the chickens out, and again in late afternoon. Some mornings, like today, the crows will be already there, waiting for us, and will greet us with a chorus of loud caws as soon as we step out of the house. Other times they’ll be waiting in the tall trees along the edges of our farm, and as we near the barn they’ll do a flyover just to make sure we don’t forget about them. 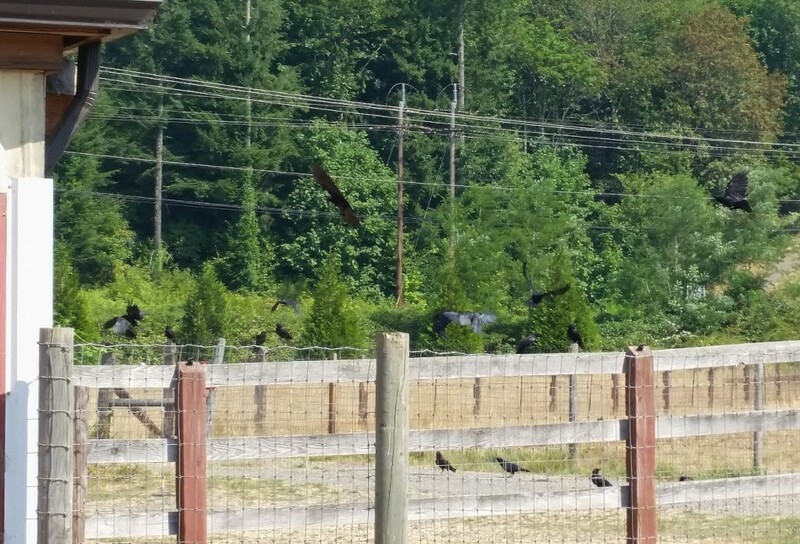 After we let the chickens out, Jeanette puts the crows’ food out on the driveway, and as soon as she steps back into the barn they come swooping in. The crows coming in for their breakfast. What the crows give us in exchange is extraordinary. They don’t just hang around more frequently, as we’d hoped. They actively stand guard over our chickens. 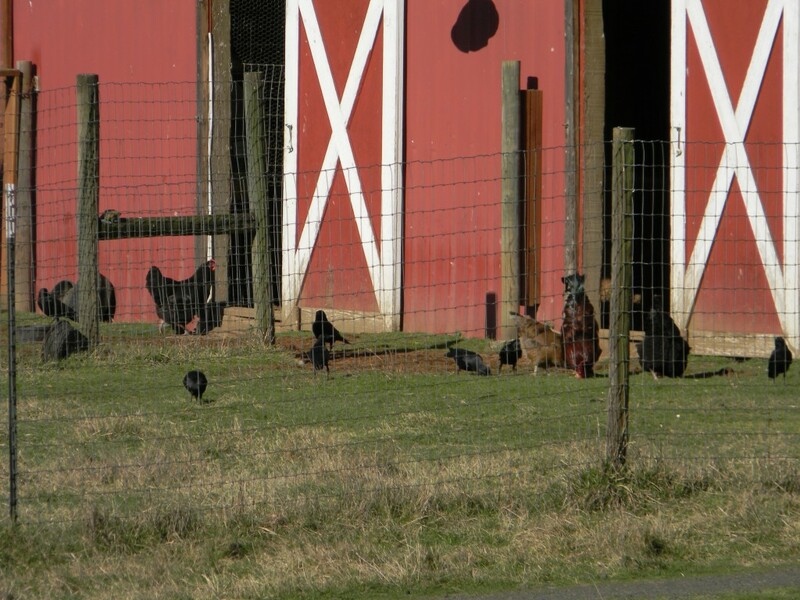 When our birds go for a walkabout, almost invariably some of the crows will take up posts on the barn roof and/or fence posts along the chickens’ pastures, keeping a lookout for hawks. Crow sentries on duty while the chickens free range. And the chickens have become quite used to the crows. After we leave the area, they mingle freely, and the crows will share in any uneaten scratch or treats we’ve put out for our birds. Crows are not quiet birds by nature–they caw back and forth to each other frequently. What is fascinating is that although to us their calls all sound quite similar, the chickens have learned to distinguish them. Generally they ignore the crows’ chatter, but there is a certain call the crows make which the chickens have learned to recognize as an alert, and when they hear that, they run full speed for the safety of the barn. 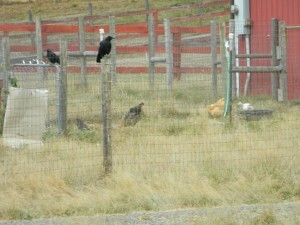 The chickens and crows socializing. We have not lost a single chicken to hawks in the past two years, since we began feeding the crows. The red-tails are still around. Just last week, as we were walking up to the barn in the morning, we saw the big male circling overhead. But a few minutes later, after we’d opened the barn and I was washing out a chicken waterer in front of it, I heard a chorus of caws and saw the crows swirling up into the air from where they’d been eating on the driveway in front of the barn. When I looked up to see where they were going, I saw the hawk flying as fast as he could away from our farm with several crows in pursuit. The crows’ behaviors that we’ve observed raise some very interesting questions about their social structure, intelligence, and communication. Around our farm, we never see a solitary crow. They are very communal–there are always at least several together, and often they congregate in large groups, as many as fifty together at a time (especially at feeding time). On a few rare occasions, always close to dusk, we’ve seen a huge swarm of crows, hundreds and hundreds of birds, flying high overhead, and our flock will fly up from the surrounding trees and join them, swooping and swirling in complex patterns. And the crows do the same thing for themselves that they do for our chickens: while most of their flock are in the driveway, eating the food we’ve put out, or are wandering through a pasture, foraging, there are always several birds stationed on fence posts, in trees, or other vantage points, standing guard to protect the flock. How do they decide who eats and who stands guard? That suggests very complex, sophisticated social structure and interaction. This is a large community sharing resources and duties and caring for each others well-being, a far more complex thing than the natural protective instinct most animals show for their own young. And how do they communicate who will do what? Typically there are a number of sentries keeping watch, and they all are looking in different directions. But if someone fails to do their job, the results could be deadly. One day by chance I happened to be looking out a window and saw what happened when someone obviously dropped the ball. Death dropped out of the sky for this crow. On this occasion, the red-tail got his revenge on his tormentors. He came down like a blur and hit this crow sentry–by its size, a young bird–hard, killing it instantly. When I stepped outside to take this picture, I could hear the other crows cawing in distress, but they kept their distance. 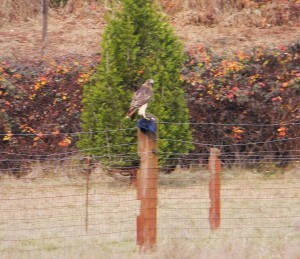 The hawk sat on the fence post for a long time, turing his head back and forth, and if taunting his enemies, then finally flew off, carrying the dead crow in his talons. Attacks on Amazon by Authors United—a group of authors, many of whom seem to have cozy relationships with traditional publishers—are in the news again. The group was founded in 2014 by novelist Douglas Preston, during book distribution contract negotiations between Amazon and Hatchette, the traditional publisher with whom Preston is under contract. The current round of attacks have been made this week at the American Booksellers Association Winter Institute, during a panel discussion sponsored by, among others, Authors United and The Authors Guild. Wow—are we talking about Amazon, or the First Order from the new Star wars movie? The next thing you know, these guys are going to be claiming that Jeff Bezos is actually Supreme Leader Snoke. Preston and Authors United have previously accused Amazon of maintaining an illegal monopoly over the entire publishing industry, and have asked the U.S. Justice Department to investigate and prosecute Amazon for antitrust practices—a request that thus far has gone unheeded. Coincidentally, last week I received an email from Amazon’s Kindle Direct Publishing division, titled “How Are We Doing?” In the email, Amazon—sounding not at all like an Evil Empire— asked authors to complete a brief survey about their experiences with the Kindle Direct Publishing program, and to offer suggestions for things they’d like to see improved or changed. I did complete the survey, but I’d like to go beyond that here, and offer my own take on the effects Amazon has had on the world of publishing. To give some context to my remarks and opinions, I’m the author of a historical fiction series called The Strongbow Saga. I am not a best-selling author. I’m what used to be called “mid-list”: my books sell steadily, and have for some years, though not in huge numbers at any given time. The first books in my series were originally published by HarperCollins, one of the big traditional publishers, but after they languished there for a number of years I was fortunate enough to be able to reclaim the rights to them, and have rereleased them, and continued the series, by publishing my books myself, including through Amazon. In other words, I have personal experience as an author with both traditional and independent publishing. So let’s talk, without all of the hype and emotion, about Amazon’s impact on the world of publishing. Make no mistake—Amazon’s impact has been enormous, and has in many ways turned the way publishing occurs upside down. But judge for yourself whether the impact and change has been a good thing, or the beginning of a nuclear winter endangering the very existence of books, writing, and publishing. When I began my career as an author, there was no self-publishing option for authors. Self-publishing, in fact, used to mean that an author paid a so-called vanity press to print copies of his or her book, because he couldn’t sell them to a ‘real” publisher. The path to getting a book published was narrow and difficult, and controlled by a series of gatekeepers whose approval had to won. First, an author had to convince a literary agent that his or her book was worthy of consideration, and persuade the agent to actually deign to read the book. If the author was fortunate—and a large part of that, of course, included if the book was sufficiently well written—the agent would agree to represent it, and would take it to the next level of gatekeeper: editors at the big publishing houses. If the agent could find an editor who could be convinced that the book, if published, would make significant money for the publisher, then a contract would be signed, and the author would have broken into the rarified world of being published, and achieved success. Except, of course, that very few authors, only a tiny percentage of those who have been published through this traditional model, actually ever achieve any kind of significant financial success under this system. Most books that are published are not bestsellers, and if that does not occur with traditionally published books, the author is unlikely to see much monetary return from his or her efforts. This was, and still is, the reality: the publisher typically will take about a year after the contract is signed to actually bring the book out into the marketplace. Once the book finally does go on sale, the author will begin earning royalties, or a percentage of the book’s price when sold—typically somewhere in the range of 6% for paperback editions, and 10% for hardcover. For e-book editions—and when my books were first published, the e-book market was envisioned and anticipated, but for practical purposes did not yet exist—the author’s royalty is 25% of the sale price. At those royalty rates, a LOT of copies of a book must be sold for the author to receive any kind of significant income, and the literary agent will take 15% off the top of anything the author does earn, for as long as the book is published under the contract the agent negotiated. How did Amazon change that? To begin with, it pretty much created, through its own efforts and at its own expense, the e-book market as it exists today. Two essential elements were needed for a viable e-book market to develop: e-book reading devices that provided an enjoyable, easy to use reading experience, and were reasonably enough priced to persuade a large number of consumers to buy one, and a large supply of e-book content that those consumers could easily acquire, for a price that would cause readers to purchase an e-book edition rather than a print book. There were e-book reading devices before the Kindle—Microsoft and Sony, for example, were among the early e-reader manufacturers. But those early devices were relatively expensive, there was limited e-book content available to buy, and what few books were released in e-book editions were priced by the big publishers so close to the cost of print editions that consumers were unimpressed, and the market for e-books remained a promising theory that didn’t catch on. Until Amazon entered it. Amazon began creating and selling its Kindle e-book readers that were smaller, lighter, and easier to use than the competition, and Amazon sold them at a low enough price—supposedly making no profit, or even taking a small loss on each sale—that consumers began to buy them in significant numbers. And year after year Amazon brought out new, improved models, and kept lowering the price. Amazon believed in the potential of the e-book market, but understood that until many, many readers—millions of readers—had devices to read e-books on, that market was never going to come alive. Amazon had the vision and understanding of what the e-book market could be, and was willing to spend its own money as an investment to make that potential a reality. Amazon spent a LOT of its own money, probably millions, to develop a viable e-book market. No one else did. That should not be forgotten. But e-book readers were only half of the equation. E-book content, making lots of books available in e-book editions, and at a low enough price to entice readers to buy an e-book instead of a print one, was the other half. And the big publishers were not supplying the content, nor were they pricing those e-book editions they did produce at a lower price than print. So out of that need for content, Amazon’s direct publishing program for authors was born. Amazon created something entirely new in the publishing world: a system where authors could bypass the entire traditional publishing path—the literary agents, the editors, the big publishing houses—and publish their books themselves, as e-books, with a major distributor, Amazon, who would handle the entire sales side for them. And Amazon offered terms the like of which no author had ever seen before, or even dreamed might be possible. If an author agreed to price his or her book between $2.99 and $9.99, the target range Amazon had determined was likely to draw readers to e-books rather than print, Amazon would pay the author 70% of each sale. Moreover, it would provide sales data to authors, telling them how many books they were selling, on an ongoing, daily basis, and would produce formal sales reports, and pay royalty earnings, monthly—a far cry from the big publishers’ practice, which continues to this day, of reporting sales and paying authors only twice per year. Amazon’s vision of what could be proved prophetic. After the introduction of the Kindle self-publishing Program (now called Kindle Direct Publishing, or KDP) for authors, and over several years of releases of successively better and less expensive Kindle e-readers, the e-book market grew by large margins, until now it makes up roughly 20% of all book sales in the United States. And Amazon has carried this vision beyond the U.S., establishing Kindle e-book stores in the U.K., and later in many other countries, building a world-wide market for e-books. Once the e-book market came to life and began generating millions of book sales for Amazon and the authors and publishers who availed themselves of this new way to publish, many other e-book distributors joined in, and have since established their own direct publishing platforms for authors, modelled after the innovation created by Amazon. Today authors can directly publish their books in e-book editions not only through Amazon, but also with Barnes & Noble, Kobo, and Apple (a major flaw, by the way, with the monopoly claim by Authors United, which seems to understand that area of the law about as well as the Malheur malcontents understand Constitutional law), and in Europe with the e-book publishing conglomerate Tolino. While it is true that Amazon still holds the largest share of the e-book market, that is neither surprising nor unfair, given the history of how the market was in its early years largely created by Amazon—and given that Amazon still does the most effective job of selling e-books to readers and attracting authors to its direct publishing program. But Amazon has not just revolutionized publishing in the area of e-books. Authors can now directly publish their books in print editions, as well, through Amazon’s CreateSpace division, and have them sold all over the world. Through the ACX Exchange, another Amazon division, authors can find partners to create audio editions of their books, and have them sold by both Amazon and Apple through Amazon’s Audible division. All of these changes have brought benefits to numerous authors, including many who, under the traditional publishing system controlled by the literary agents and big publishers, might never have seen their books published at all. But it is not just authors who have benefited from the innovations Amazon has brought to the publishing world. There are numerous new jobs and opportunities that have come into existence because of these changes. The audio editions of my own books, for example, were created by a young man (and at my age, I’m finding myself using that description “young” more and more frequently) who has been able to carve out a successful independent business for himself by virtue of his strong work ethic, amazing talent as a voice actor (my books have lots of dialogue and numerous characters, but he performs each with a distinct voice), and the ability to connect with authors through Amazon’s ACX Exchange. He has, at a young age, been able to build for himself a career that didn’t exist before Amazon began transforming publishing. Similarly, there are numerous graphic artists who are now able to maintain successful independent businesses designing book covers for authors who self-publish their books through Amazon and other direct publishing platforms. Thousands of people benefit financially from the changes and upheaval Amazon brought to the publishing industry. The big publishers, and the literary agents whose livelihood is inextricably linked to them have, of course, lost some business due to these changes in how the world of publishing works—what their claim that Amazon is “destroying the culture of book publishing” really means. That change is occurring does not mean, however, that book publishing is on the verge of destruction. Amazon is not destroying the world of book publishing; it is transforming it. Transformation and destruction are not the same thing. There are many, many authors, including me, who can finally make a living from their writing, who could not under the old traditional publishing system. What Amazon has done is to democratize publishing. The oligarchs who used to hold total control over the publishing process are unhappy about that, because they are losing power and money as a result of the changes that are occurring. Thus the overheated outcries by groups tied to the traditional model like Authors United and the leadership of The Authors Guild (and I used to be a member of the Guild, but let my membership lapse due to my disapproval of their positions). Those who have become part of the successful one percent of authors under the old, traditional model cannot see beyond themselves to realize how the changes that are occurring benefit so many. So Amazon, when you ask “How are we doing?” of the authors who choose to publish their books through the many innovative publishing systems you’ve created, who sell their e-books and audio books in marketplaces you largely brought into being, and who can get print editions of their books sold in many countries around the world thanks to you, I personally would say you are doing damn well. I have a vision of Judson wandering around his house wearing a Helm and a Brynie chatting to His Fylgja. Excellent stories bringing history to life. A challenge for every author is to continually reach new readers who have not yet discovered his or her works. To that end, this week Viking Warrior will be a BookBub featured deal in the historical fiction category on Wednesday, January 13th. In support of the promotion, the e-book version of Viking Warrior will be priced at 99 cents in the U.S. and 0.99 GBP in the U.K., through Friday, January 15th, on Amazon, Nook, Kobo, and ITunes. During the coming months, I plan to periodically post about book 5, the final installment of The Strongbow Saga. Some of the posts will offer tidbits and glimpses into the story itself. Others, like this one, will explain some of the processes I follow to write the book. Writing this story does not come easily to me. It is not simply a matter of sitting down at my computer and banging away on the keyboard, churning out X number of hours and words per day. I know writers who do that, and am awed that they can. But for me, writing—writing this story, at least—is a complex and slow process. I first began working on The Strongbow Saga in the late 1990s. Over time, as my years of research into the world of the Vikings revealed new aspects of their history and culture to me, and as characters became more vivid and took on lives of their own, the story has evolved considerably from my earliest concepts, though its core elements have remained the same. Now, finally, I am writing the last installment of the story. In truth, I am more than a little bit intimidated by the task. Over the years I have been contacted by a great many readers, and I have more than a few times been stunned, though certainly very gratified, by those who have told me how much the story has moved or touched them. Many readers have been waiting a very long time for the conclusion of this story—Viking Warrior, its first installment, was initially published ten years ago, in 2006. For all of the readers who have been waiting for years, for all those who have been touched in some way by Halfdan’s tale, and for all those who have not yet found the story but someday will, I want to get this right. I have to get it right. I do not want to let you down. The first step of the process is that I must, once again, become Halfdan. Halfdan is not just the hero of the story. He is its voice. It is told through his perceptions, his experiences, his thoughts. To become Halfdan, I must immerse myself in him, in his story. Halfdan is a man of the 9th century, of a distant time and a very different culture. I am a man of the 21st century, but when working on Halfdan’s story I must, as much as possible, shed my own skin, my own perceptions and attitudes, and adopt his. Otherwise, I cannot write true to Halfdan, and to the story. To do that, I have been rereading each of the four books of The Strongbow Saga, taking detailed notes as I do. I have been refreshing in my mind how Halfdan perceives the world and the events he experiences, I have been reminding myself of the things that have shaped who he is, and how he grows and changes over the course of the story. As the Norns weave the threads of all men’s lives into the fabric and pattern of fate, so I must weave together the numerous threads that have made up each installment of this story in order to give it the culmination it, and its readers, deserve. What would Halfdan do? I must become him, and let him tell me. When I was growing up, Gumbo was a traditional post-holiday meal after Thanksgiving, both because my father loved it, and because it’s a great way to use the carcass from the holiday turkey. In recent years, Jeanette and I have revived that tradition in our own home. 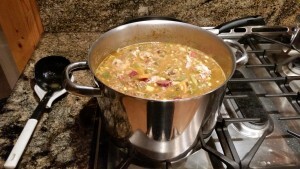 Here’s how to cook my version of Gumbo–if you’re having a turkey for Christmas dinner, consider saving the carcass once it’s done and giving this a try. This is not the dish you would get if you order Gumbo in a New Orleans restaurant. A fancy chef’s version of Gumbo is going to be all about the roux, the thick, dark brown base to which a limited amount of vegetables and either shellfish or meat are added, then it’s served over rice. The Gumbo I make is closer to the dish’s roots: a hearty, backwoods, catch-all stew, which originated in southern Louisiana in the 18th century. It takes a bit of time to prepare, and it makes a large amount, but if you’re not feeding a crowd, don’t worry, the leftovers freeze well and make a wonderful already prepared meal to pull out of the freezer at a later date. 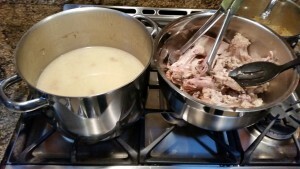 The first step is to make the broth.That’s where the leftover turkey carcass comes in. If you don’t have one, you can also use a chicken carcass–you’ll just end up with a smaller batch of soup. For the past two years, we’ve used the spatchcock method of cooking our Thanksgiving turkey, in which you cut out the bird’s backbone, press the bird flat, and soak it in a wet brine for one day and a dry rub for another before roasting it. So we had some raw pieces–the backbone, neck, the wings, and the gizzard, heart, and liver–which we’d tossed in a bag in the freezer at Thanksgiving. 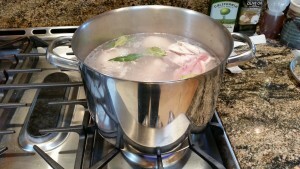 We started our broth by putting those pieces in a large stockpot with a coarsely chopped onion, a carrot, and several bay leaves, covering them with water, and simmering for about two hours. Then we added the carcass from the cooked turkey, from which most of the meat had already been removed, and simmered the lot for about another hour. Once the carcass pieces are beginning to separate, using a slotted spoon and tongs, remove all of the bones and meat from the broth. After they cool, pick the chunks of meat from the bones and set aside. If you have a dog, save the gristle, skin, organ pieces and the like in a separate bowl. Our Border Collie Sigrid feasted on those, stirred into her dry food a little bit at a time, for almost a week after Gumbo day. 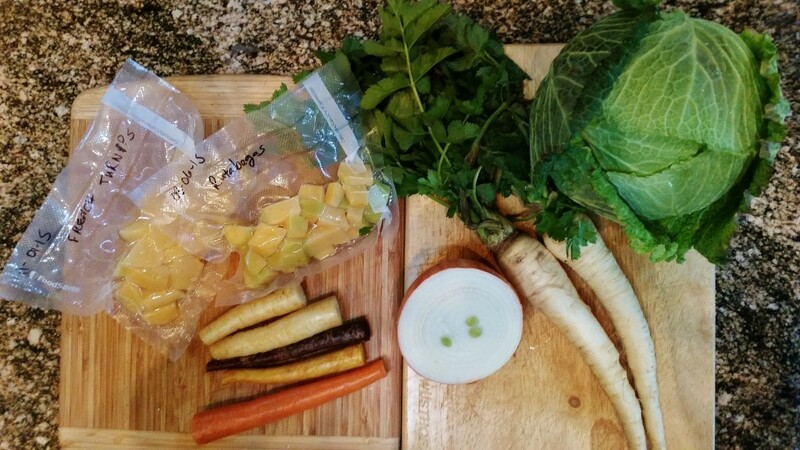 While waiting for the turkey bones to cool enough to pick, add your vegetables to the broth. Chopped okra is a classic Gumbo ingredient. Don’t worry if you normally don’t care for okra–it blends in with all of the other ingredients. And don’t worry about following our choice of vegetables too closely–make the soup your own by adding what you want in it. 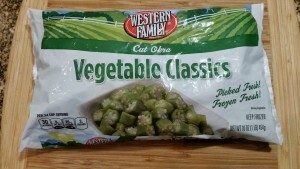 In addition to okra, onions, garlic, celery, and bell peppers are classic Gumbo ingredients. They’ll add more flavor to the soup if you saute them in olive oil before adding them to the broth. Thyme is a classic herb used in Gumbo (thyme and sassafras root are the ingredients in Gumbo file, a powdered seasoning and thickening agent used in some versions of Gumbo), and we typically add oregano and marjoram, also, because we have patches of all of them growing in our greenhouse. Chop the oregano and marjoram and add them to the onions and peppers when you saute them. 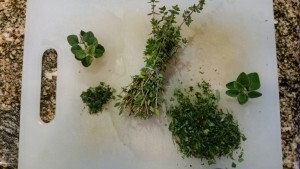 The easiest way to use fresh thyme, rather than picking all of those tiny leaves off of the stems, is to just tie a bunch of stems together with thread into a bundle and throw the whole thing into the pot. As the soup cooks, the leaves will come off the stems and become disseminated throughout the pot. As I mentioned above, this is not fancy purist Gumbo–this version is a hardy, catch-all stew–a true peasant food. 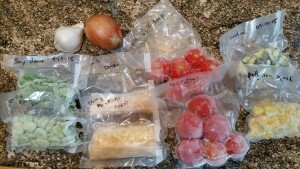 Since moving to our farm where we have a large garden, Jeanette and I now just pull out packs of vacuum-sealed frozen vegetables when making soups and stews–for this batch of Gumbo we used green beans, fava beans, corn, chopped yellow squash, chopped zucchini, tomatoes, and fire-roasted hot peppers. The frozen tomatoes are easy to use in recipes: while still frozen, dip them for a few seconds in a bowl of hot water, which will cause the skins to split and loosen. 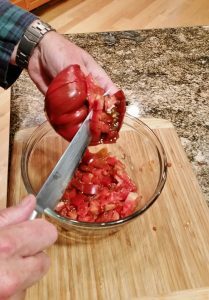 Remove the skins, coarsely chop the tomatoes, and throw them into your dish before they thaw and become messy. 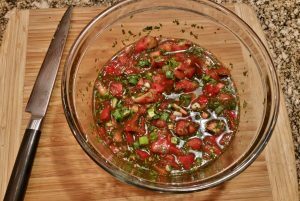 But before we had a large garden, a quick and easy shortcut we used when making Gumbo was to just add a bag of frozen mixed vegetables (in addition to the okra), and use canned diced tomatoes. Gumbo is an easy soup to customize by varying the meat you use. 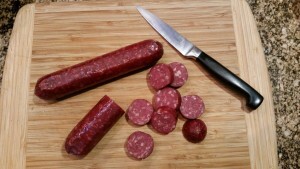 In addition to the turkey, we like to add some pieces of spicy sausage–in this case some smoked Polish beef sausage made by Knee Deep Farm, a grass-fed beef ranch near Eugene. 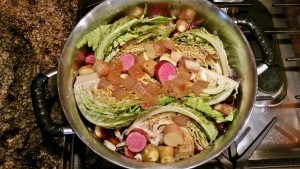 If you do use sausage, add it to the broth at the same time you add the vegetables. At this point, most of the work is done. Simmer the soup for at least an hour to cook all of the vegetables, but it’s a very forgiving dish, so you can easily let it simmer longer–doing so will just give you a thicker soup, and will blend the flavors more. Periodically taste the broth and add sea salt as needed, and adding some white wine will also add flavor to the finished broth. About twenty minutes before you plan to serve your meal, add the pieces of reserved turkey meat back into the soup. If you plan to add rice, a traditional Gumbo ingredient, be sure it’s cooked by now. This version of Gumbo is hearty enough that you don’t really need rice, but we often serve ours over a hearty rice-like grain such as faro or spelt. We like a Gumbo that includes seafood, so we usually also add a handful of shrimp at this point–when we add the turkey meat–and if we have them, we gently simmer some shucked oysters in a saucepan in white wine and a dash of Worcestershire until their edges just begin to curl. To serve, put a few spoonfuls of your cooked rice or other grains (if you’re using them) in the bottom of each bowl. If you’re adding oysters, put a few in each bowl, then ladle the hot soup on top. A salad on the side, and some bread–preferably fresh baguette–to sop up the dregs of soup once you’ve emptied your bowl, and you’re ready for a delicious, hearty meal. 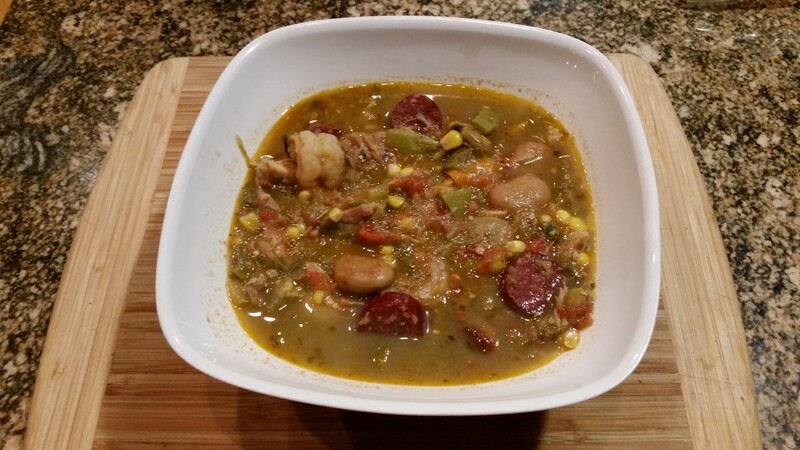 If you enjoy spicy heat in soups and stews, Tabasco Sauce complements this Gumbo very well. First, a brief commercial: there’s still time to take advantage of the Northman Books 2015 Holiday Sale, and get autographed copies of the Strongbow Saga books at reduced prices in time to give them as gifts for Christmas. And Strongbow Saga t-shirts are also on sale in the Northman Books online store. I grew up in the south. The green beans I ate as a child were called string beans, or sometimes snap beans, because to prepare them you would break or “snap” them into roughly one inch long pieces, peel off the tough string along the side that was exposed when you did that, them simmer them in salted water for a long time, usually with a ham hock for added flavor, because they were tough and it took a long time to cook them into tenderness. They were delicious, and I still occasionally cook them that way to this day–our nickname for them now is “hammy beans.” But in 2005 Jeanette and I experienced a totally different kind of green bean and way to prepare them. That year we saved up our pennies and traveled to Paris to do research on what would become books 2 and 3 of the Strongbow Saga. The background setting for those books was an actual Danish military campaign in the year 845 A.D., during which a fleet of 120 Viking ships raided up the Seine River and ultimately captured the city of Paris in a surprise attack on Easter morning. The historical campaign was an amazing story, and made a wonderful backdrop for a portion of Halfdan’s story in The Strongbow Saga. But I had run into a problem: I could not find any information at all about what the city of Paris looked like in the year 845, and I was trying to tell the story with as much historical accuracy and detail as possible. Thus the trip to Paris came about. 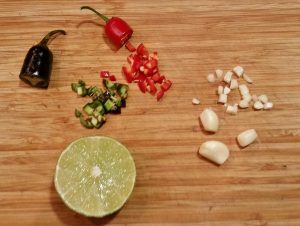 But this post is not about the research and what I learned–it’s about beans. When we travel (which is not often), Jeanette and I don’t like fancy hotels and restaurants. We like to stay in B&Bs or small inns, and eat in the small restaurants and cafes where the local people eat. One night in Paris, we ate in a tiny little cafe, run by a father and his adult daughter, and had a very simple meal–a roasted chicken leg and sauteed green beans were the primary components. But though the meal was simple, it was delicious–so much so that we ate there again and had the same meal another night. The chicken had more flavor than I’d ever tasted before in chicken (and I later came to realize that was because of the way most chickens raised for meat by commercial poultry factories in the United States are produced), and the beans were an entirely different vegetable from what I’d grown up eating: they were crisp and delicate, very light and flavorful and crunchy. As we later discovered, they are also very fast and easy to prepare. Here’s how. You don’t want to buy the standard green beans that are widely available in most U.S. grocery stores. What you’re looking for are beans that were picked when they were still young and delicate, much narrower in size than the standard beans. Fortunately, they’re becoming much more readily available in grocery stores, and are a popular item in many farmers markets, too. We grow our own now, and for the gardeners out there, the variety we like best are a heritage breed called Spanish Musica. 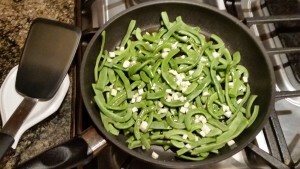 They’re slightly different from traditional French haricot verts varieties, which tend to produce round, slender beans about the diameter of a slim pencil–Spanish Musica beans are flattened in shape. But we prefer them because when picked at a very young and slender size, they’re perfect for haricot verts, but if you let them get larger they still cook up tender and delicious when used in soups and stews. And you can grow a lot of these beans on a very small footprint in your garden which, when we used to live in Texas and only had a tiny garden, was an important consideration. Spanish Musica are pole beans, which means they’re essentially a vine that needs some kind of support to climb on, and these are very vigorous climbers. We use bean towers sold by Gardener’s Supply, and can grow a summer’s worth of beans, and have plenty to put up for the winter, using a single tower, which only takes up about 18 square inches of ground space. And when production starts to fall off, don’t give up on the vines. Water the foliage with a soluble fertilizer such as fish emulsion, and they’ll produce a whole new round of blossoms and beans. But I am digressing. 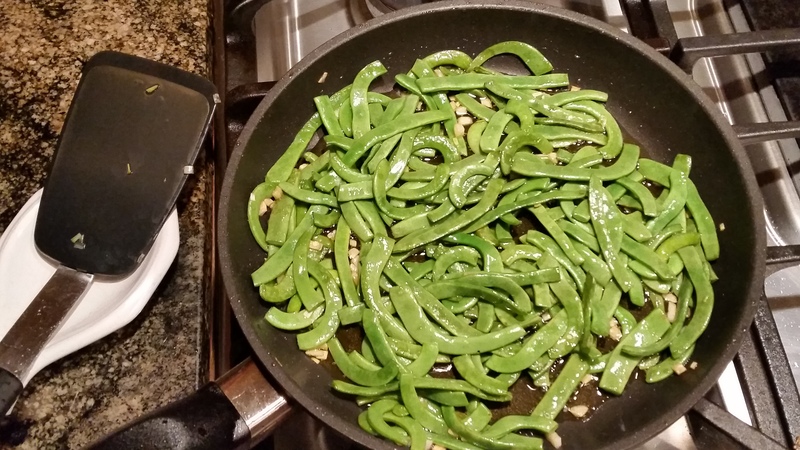 This is about how to cook haricots verts, not how to grow them. 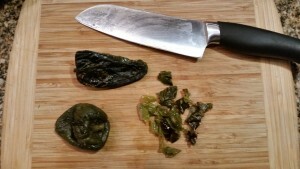 As I mentioned earlier, you want to use beans that are young, small, and tender. In this photo, the beans on the bottom of the cutting board are the size you want–the ones on the top have gotten large enough to be more suitable for use in soups or stews. 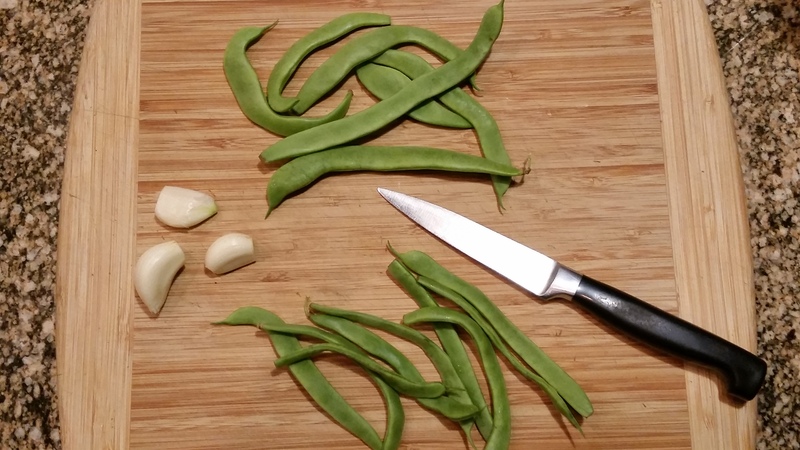 Trim off any pieces of stem, and cut the beans into roughly two inch pieces–for most beans, this will be just cutting them in half. Coarsely chop three to five cloves of garlic. 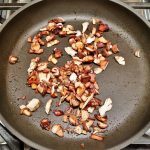 Coat the bottom of a skillet with a good quality olive oil–it’s a major component of this simple dish, so pick a flavorful one–then add the beans and garlic. Turn the heat on to medium high, and saute the beans, stirring constantly. This won’t take long, because the beans are tender to begin with, and you want the final product to still be crisp and crunchy. When the garlic has turned a light golden brown and the beans have turned a bright green and are just beginning to show a little browning or blistering in spots, remove them from the heat, salt lightly, and serve.